Sometimes things just randomly show up at my house. Packages that I wasn’t expecting and never expressly asked for. It’s a blogger thing. Brands sometimes send you “gifts” or unexpected deliveries in hopes that you’ll provide coverage. Sometimes I do, sometimes I don’t. It depends on the contents of the package, what’s going on in my life when it randomly arrives, and any pre-existing relationships I may have with the company that sent it. A little over two years ago now I had a package show up from The Secret Mountain. They had sent along an email with a heads up that they had shipped me a copy of one of their newest releases, A Gift For Sophie. The package arrived at a point when my life was pretty hectic, so I put it onto a shelf in our computer room. I had, in the back of my mind, a thought to include the book in my holiday gift guide. Then my Dad passed away and life was a mess. I cancelled my gift guide for that Christmas season. The unopened package ended up sitting forgotten on a shelf in my computer room, collecting dust. One day this past December, while tidying up the computer room, I came upon the package and instead of shuffling it off to the side, as I had done several times in the past, I opened it up and gazed at the sealed book and CD set within. I felt a tiny bit guilty that I’d had the book in my possession this long and hadn’t done anything with it. I debated donating it, but instead ended up putting it with the small pile of things I was giving the girls this Christmas. So come Christmas morning my five year old found A Gift For Sophie waiting for her under the tree. When I finally opened the book up and sat and read it with her I was struck with intense regret that I hadn’t opened that package sooner. I found it a bit ironic that I had pushed the package aside because of the death of my father, because as it turns out A Gift For Sophie would have been a perfect book for reading just after my Dad passed away. 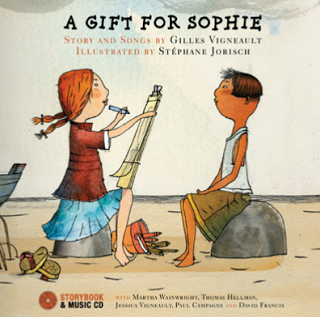 Like all of the books published by The Secret Mountain, A Gift For Sophie is a lovely little hardcover picture book with an accompanying CD. Unlike the other Secret Mountain books I’ve reviewed in the past, A Gift For Sophie tells a story. The CD includes a read-along version of the story, as well as nine songs. The story focuses on a girl named Sophie, her young friend Emilio, their friendship with Old Man Tom, and what happens after he passes away. It talks about the gifts of the heart and how our memories go on. There are plenty of other picture books out there designed to help children work through grief after the death of a loved one. A Gift For Sophie is a beautiful story, that just happens to also feature death, as a natural part of our journey. It’s not in your face about it. 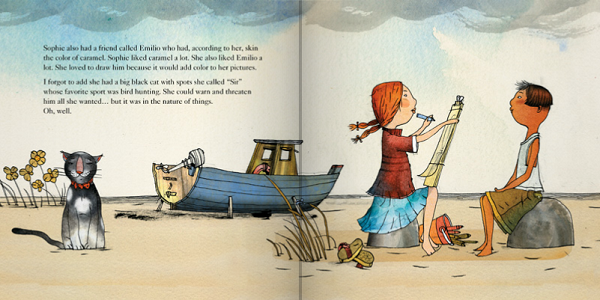 It also features children forgetting sadness and moving happily on with their lives, as children do, without guilt. A Gift For Sophie is available for purchase directly from The Secret Mountain website for $22.95. 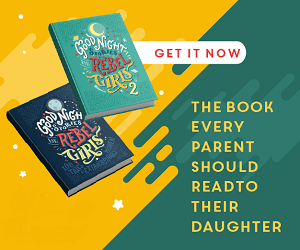 The book is also available as an enhanced ebook for iPad and iPhone with the narration of the story followed by two recorded songs, for $7.99. Or you can purchase the digital download, which includes not only the music from the CD but also printable PDF files of the illustrations and text, for $9.99. – connect with them on Facebook. – connect with them on Twitter. I couldn't even finish reading your post. My eyes started to well up. I will have to get this book. I have been through so much. My cousin committed suicide when I was pregnant with my 2nd. My mom died when I was pregnant with my 3rd. I delivered my baby on my nieces bday in my bathroom myself!! I don't see this special niece of mine sadly. After my cousin died I bought a book called unbinding the heart by a Greek woman named agapi. I stopped reading it over half way through and after my mom died I started reading it again. Ironically I was at the part where her mom died of a heart attack. Life is crazy. It is difficult to lose a parent. On the tough days just have to remember we are still here. :). This looks like a lovely book. I love the illustrations and the fact that it deals with the death of a loved one in a matter of fact nature. I listened to The Suitcase Waltz and it was, indeed, very charming. Thanks for the recommendation.